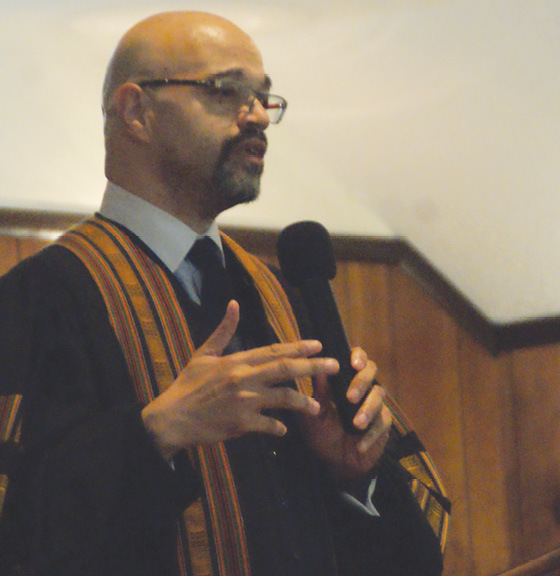 At Suffield’s Interfaith MLK Day observance, the Third Baptist Church’s new pastor, Rev. David E. Penn, delivered an impassioned plea to overcome hatred and intolerance. This year’s interfaith service at the Third Baptist Church honoring Dr. Martin Luther King, Jr.’s birthday, January 21, was held almost five weeks later on February 24, and that was two years after the last such observance in town – both delays having been caused by weather problems – but the event made up for the delays with its enthusiastic spirit and the forcefulness of the messages offered. The little church was close to full when Suffield’s Interfaith Choir and members of Third Baptist marched slowly in with the customary powerful opening spiritual, We Come This Way by Faith. The main message of the afternoon was delivered in a traditional manner by Third Baptist’s new pastor, Rev. David E Penn, with the expected enthusiastic response from his audience. Perhaps in deference to the interfaith audience, his address was not overlong, but he had time to make strong points about the need to overcome hatred and intolerance, likening the task to David’s task against Goliath. He spoke of Dr. King’s education for that fight at Morehouse College in Atlanta, which began after the Civil War as a training ground for educating black men for the ministry and teaching. Rev. Penn regards King as a contemporary prophet. A major feature of Suffield’s traditional MLK service is the music, and this occasion didn’t disappoint. We Shall Overcome was of course included, and both the Interfaith Choir and Third Baptist’s W. N. Allen Men’s Chorus filled the building with powerful music, prompting many present to add rhythmic hand-claps, affirmative interjections, and tambourine accompaniment. The service ended with a heartfelt, Lift Every Voice and Sing. Many present stayed for the generous buffet supper and good conversation downstairs.